"My Grandma grew up on a farm and this was her recipe - no shortcuts but still pretty easy. For best results you must use a whole chicken and flour. You can also use some chicken stock for added flavor. The trick is the lemon which makes the chicken tender and adds flavor to the soup. Leftovers won't last very long with this." Place chicken and 1 pinch salt in a large pot; cover with water. Bring to a boil, skimming any scum off the surface with a slotted spoon. Add lemon, celery, onion, and carrots. Simmer broth over medium heat until chicken starts to fall off the bone, about 1 hour. Discard lemon. Remove chicken from the pot; let cool. Place flour, salt, and pepper in a large bowl. Make a well in the center. Ladle in 2 to 3 scoops of hot broth. Mix in flour with a spoon until dough comes together into a ball. Turn dough out onto a floured surface. Knead carefully until smooth. Roll out into a large rectangle; cut into small rectangular dumplings. Drop dumplings one at a time into the simmering broth. Cook, stirring occasionally, until tender, about 30 minutes. Bone chicken and chop into pieces. Add to the pot; cook until heated through, about 5 minutes. Substitute a handful of baby carrots for the carrots if desired. 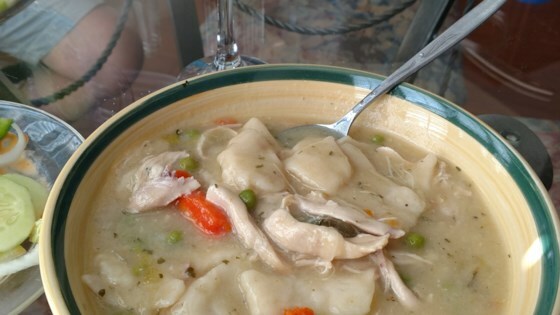 This is a great base for chicken soup too - just use noodles instead of making dumplings. Cook the noodles right in the soup for added flavor and add some peas! I gave it 3 stars because it wasn't awful, but my family didn't care for it. The general comment was that it tasted like chicken pot pie filling. They aren't fans of that either. I made this for my mom on her 69th birthday. I added fresh peas and sliced carrots. She said that it was just like her grandma used to make for her birthday when she was a child. Have made this a few times... absolutely delicious. It is better than Cracker Barrel. I however did not add the lemon and added some frozen peas.